We’ve recently made big life changes and we couldn’t be happier. Moving to Hawaii has been a big geographical shift, but also has brought more everyday happiness, as we imagined it would. In conversation with others here on Kauai, a recurring theme comes up: “If I had known how happy I’d be, I would have moved here a lot sooner.” This got me thinking about the relationship between imagination, options, and how we as individuals choose and maintain our own reality all the while seeking greater happiness in life. Even though it seems like we couldn’t be happier right now, could we be? If you don’t feel as though you’re as happy as you could be, could you make life changes to be happier? While we firmly believe in the pursuit of happiness as societal and constitutional bedrock, the fact is: in the United States we’re not all that happy. Laura Musikanski and John de Graaf, co-founders of The Happiness Initiative, believe the metric we use to determine success is problematic. They point out that the U.S. Gross Domestic Product is an economic indicator which belies our less than satisfactory results in poverty rates, rich-poor gap, health care expenses, stress and loneliness levels, and consumption of anti-depressants. Many people seek life changes to kick start improvements in these areas. 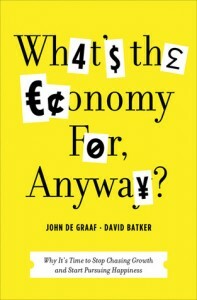 What would a Gross National Happiness number look like? I was alerted to The Happiness Initiative’s Happiness Survey by Facebook friend Jeffrey Willius, who observed, “Of the 11 happiness factors surveyed, at least 8 are directly impacted by the amount and quality of our connection with Nature.” We’ve certainly found a deeper daily connection with nature here on Kauai. Our house is open to the elements and surrounded by the jungle, and our daily activities are governed more by the weather here than they were on the mainland. We attribute a lot of our current happiness to our impressive natural surroundings. 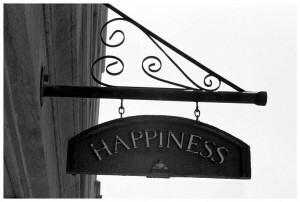 The Happiness Initiative bases its work on a Gross National Happiness Index developed at San Francisco State University. 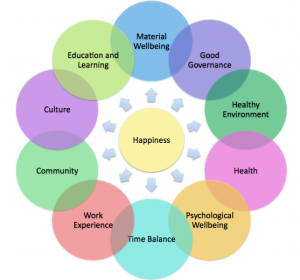 This index measures satisfaction within the framework of 10 domains: material wellbeing, physical health, time balance, psychological wellbeing, education and learning, cultural vitality, environmental quality, governance, community vitality, and workplace environment. Average scores of over 20,000 people who’ve taken the test indicate happiness levels by domain range from a low of 50 (Time Balance) to a high of 71 (Social Support) on a scale of 1 to 100. The “happiness median” between all the domains was disappointingly low. Even though the United States has the world’s highest GDP, we only rise to 11th in a Gallup-Healthways poll on “life satisfaction.” We were pleased to note Hawaiians are the happiest Americans! Aside from that, though, how come Americans are not happier as a whole? Tomas Chamorro-Premuzic, writing for the Harvard Business Review, cites research that indicates “…the association between salary and job satisfaction is very weak.” He found a great deal of evidence to suggest hidden psychological costs associated with monetary rewards actually help plateau satisfaction levels once a certain salary threshold (about $75,000 annually according to one academic paper) is met. Begin work out of school and your happiness plummets, appearing only to regain its previous level by your late 50’s! While high comparative income (based upon a traditional career/life trajectory) may be responsible for a certain amount of satisfaction, it doesn’t appear to buy happiness. What life changes along our personal pathway might help us be happier? Psychologist Dan Gilbert, who wrote Stumbling on Happiness, theorizes that our imaginations are limited, and therefore steer us wrong in our search for happiness. We tend to imagine, and therefore believe, certain things will make us happier than they actually do, and we rationalize to make disappointing outcomes more acceptable. Yet, we don’t learn from our experience, and keep repeating the same errors: we amp up our careers, shoot for more money, and try to keep up with the Joneses. Many times, our imagination feeds on our insecurities, leading us to dread upcoming events rather then view them as positive opportunities. 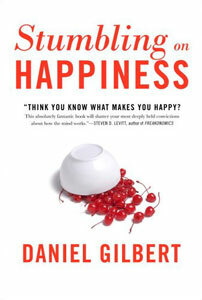 Gilbert’s book talks about the “why” of happiness levels, but according to some reviewers offers little more than the suggestion to interview others in order to determine what might make you happier. 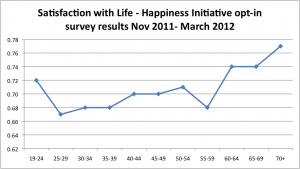 Don’t we look toward making specific life changes as part of the “how” of happiness? 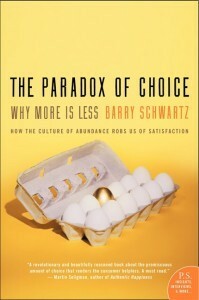 Likewise, Barry Schwartz, in The Paradox of Choice: Why More is Less, believes unrealistic expectations (and the unhappiness associated with them) are linked to what we imagine as limitless options. When expectations aren’t met, we respond by feeling dissatisfied, anxious, and even depressed. Schwartz believes that if we limit our choices, we impose the discipline we need to focus on what’s important. We’ve written about the consequences of indecision and the paralyzing, limbo effect that chronically-uncertain people inflict upon themselves here at PassingThru, too. At this less distracted level, The Happiness Initiative recommends you adopt gratitude, practice kindness, and sit silently for 5 minutes a day (a sort of mini-meditation in which you remain in the moment). All of these sources seem to point to achieving a higher Gross National Happiness from a simpler existence. Our experience, both here on Kauai and back on the mainland as we simplified and eliminated, dovetails with this concept. We’ve heard corroborating stories from others who have made similar discoveries, as well. Rejecting the career treadmill’s higher income/acquisition cycle has led us to greater meaning and rewards. We couldn’t be happier – or could we? Stay tuned! How to be happier: Catch the happiness virus.